Nellie’s PVC Free Dryerballs: Work in Progress? I really wanted to like poor old Nellie’s PVC-free dryerballs. A few years ago on another blog, I had complained about the dangers of PVC and questioned why a supposedly green product contained it. As for the Nellie’s dryerball claims about reducing drying time and wrinkles, plus softening clothes, I don’t think I can fully give you my opinion. I’ve had to stop using the dryer balls after less than two weeks. 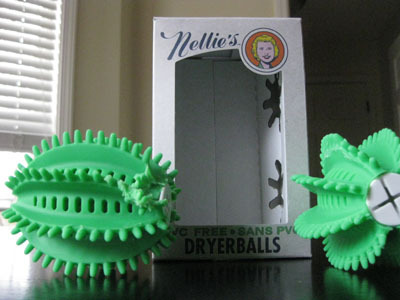 Nellie’s PVC-free dryer balls are crumbling and melting before my eyes. I thought everything was going fine. The balls make laundry time rather loud, but they seemed to soften clothes without the use of any other fabric softener or vinegar. I didn’t do any timed tests to see if the balls reduce drying time, but I did start to notice green particles in my lint trap. Upon closer inspection, I realized the balls were starting to disintegrate after less than a dozen uses. I decided to keep on using one of them to see what happened. Then, I heard ungodly compacted shrieking noises coming from my dryer. In a full towel load, a Nellie’s dryerball got seriously maimed. It seems that the ball wasn’t able to bounce as much as it liked ( ?! ) and it melted a bit. That’s when I gave it up. I received these dryerballs as a stocking stuffer, and I was so excited to try them. Now, I can’t believe that Nellie’s makes such a wasteful product. If they don’t last, then they certainly aren’t green. I never tried their previous blue dryerballs, so I can’t compare. If you want an alternative to Nellie’s dryerballs, try wool dryer balls sold at Buddha Bunz. This very popular, mommy-made product may be worth the wait after you order. My sister-in-law loves them, but I’m allergic to wool. Some people also try tennis balls in the dryer, but I’m unsure of the safety of repeatedly heating them. To soften clothes naturally without adding any sort of ball to your dryer, simply pour a half cup of vinegar and/or baking soda into the washer during the rinse cycle. Also, place a few drops of your favorite essential oil on a cloth in the dryer for fragrance. How do you soften clothes and reduce dryer time? Back in 2008 at another blog, I wrote a post called Dryer Balls of PVC about how disappointed I was that so many of the so-called green dryer balls contained PVC (polyvinyl chloride) — an ingredient many companies are phasing out due to health and environmental concerns. Later, someone left me a follow-up comment about how my concerns were heard and Nellie’s All-Natural currently offers a PVC-free dryer ball! You can order online at nelliesallnatural.com or delight.com. 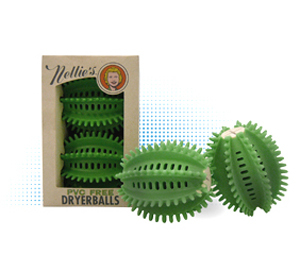 PVC-free dryer balls from Nellie’s should also be available in stores that carry the Nellie’s All-Natural line of products. Dryer balls are supposed to lift and separate fabrics, resulting in less lint and wrinkles and softer clothes. Drying time should be reduced as well. 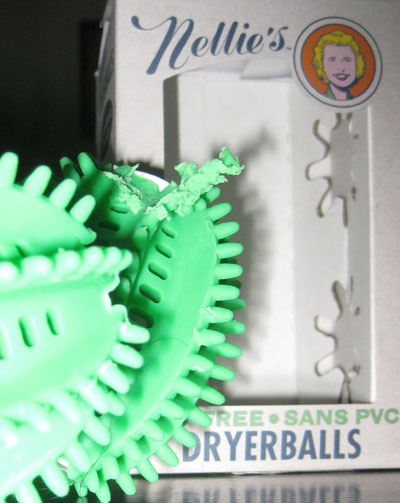 The new PVC-free version of Nellie’s dryer balls have an opening for lavender dryer sticks containing essential oil. What is your opinion on dryer balls?